The last few weeks have been busy. 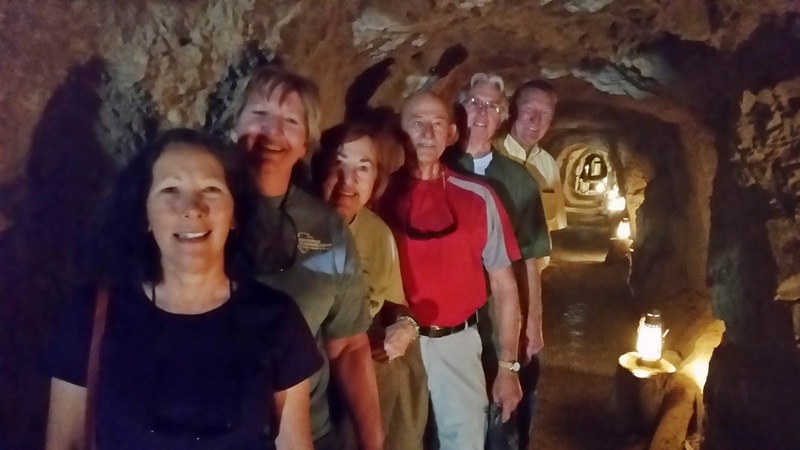 A group from our campground decided to drive about 30 miles south of Boulder City to Nelson and tour the El Dorado Mine. Mining in this area began around 1850 and continued until WWII when the mines were closed to divert resources to the war effort. Early on the area was referred to as Techatticup. This was the Indian word for hungry. Local Indians would come into the area asking for food. Miners would show them pieces of quartz (an indicator of gold) and offer to trade them food if they would show them where the quartz could be found. 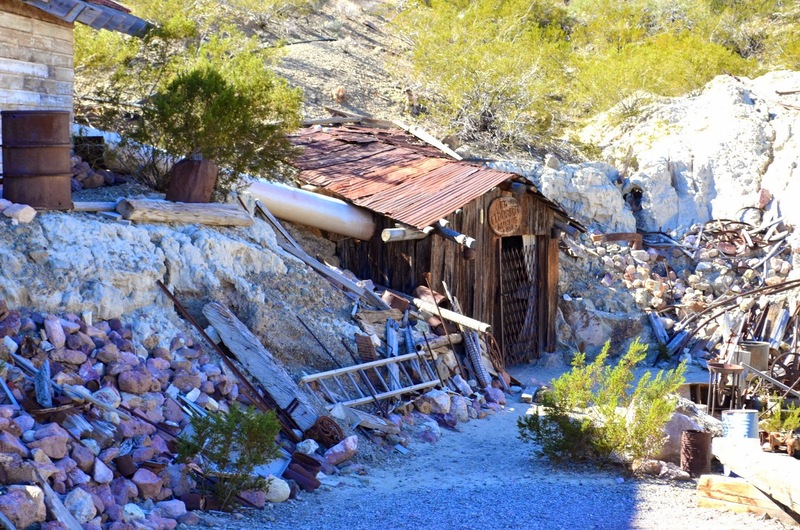 The El Dorado mine was one of the richest mines in the area producing millions of dollars of gold, silver, lead and copper. In some places the tunnels of the mine stack one on top of another to a depth of over 400'. The area was so remote there was little if any law to be found and the area became quite ruthless. At one point there were 3 owners of the mine and the day after the discovery of a large gold deposit, 2 of the owners died of strychnine poisoning.....one of those things that make you go hmmmmm! The process of extracting the precious minerals from the ore involved crushing the ore, then making it into a slurry where the gold & silver would actually rise to the top of the mix and be skimmed off, before being poured into molds forming dore (pronounced dory) bars. The remaining slurry was then dumped out onto the ground. 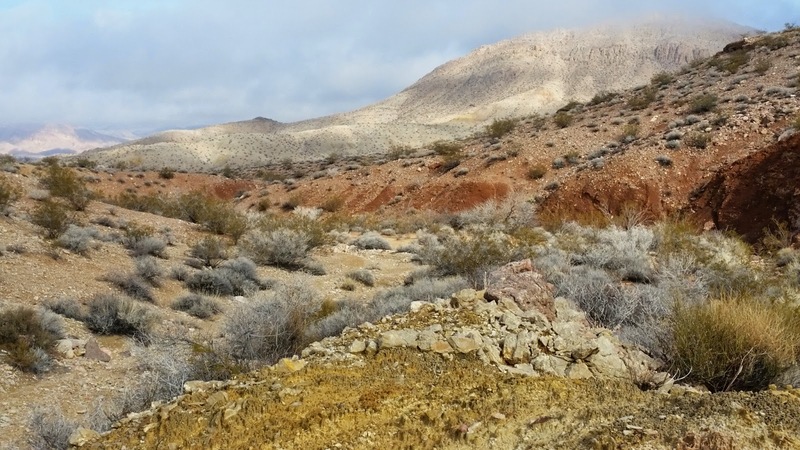 As a result the entire area in and around the mine has a thick layer of discolored soil. 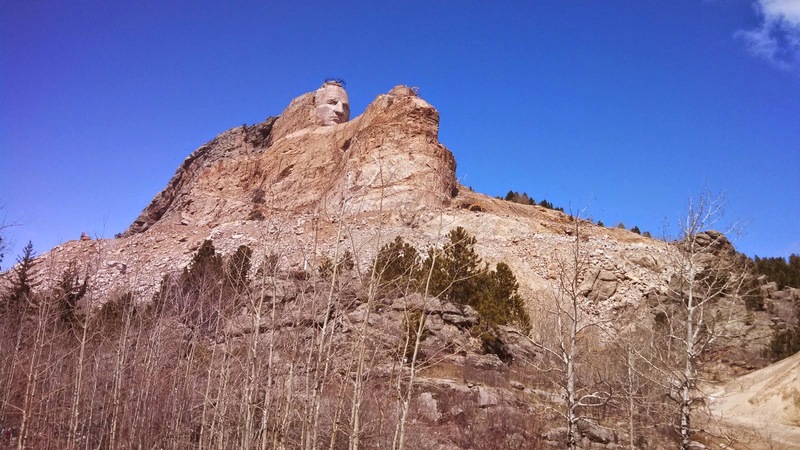 An entrepreneur has approached the current mine owners and is proposing to scrape off several feet of the discolored soil and process it to extract more gold. This could be a lucrative endeavor. can see the ghost of one of the mine owners! The current owners are working hard to preserve the history of the mine and surrounding area by bringing in and displaying all types of artifacts and memorabilia. They are also working to document stories and histories about the mines and the people who worked and lived here. If you ever get the chance to visit, it's well worth the trip. And there are even tales of ghosts in the mines that appear in numerous pictures taken during the mine tour. 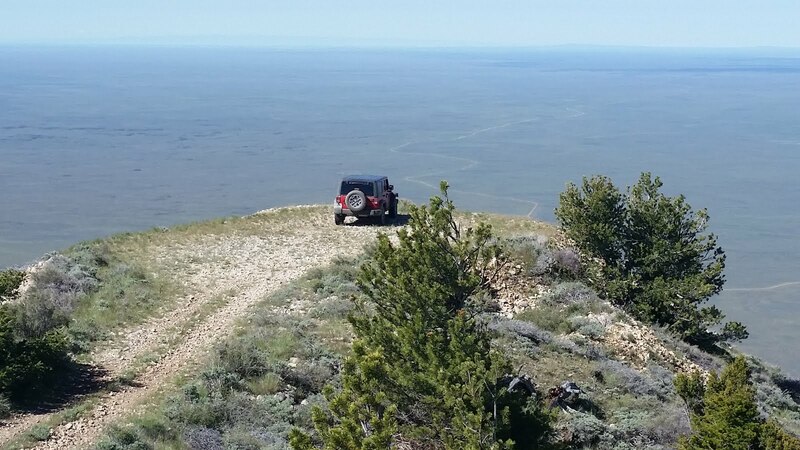 We've taken the jeep out a couple of times and shared some of the views we get during our volunteer job with other co-workers. 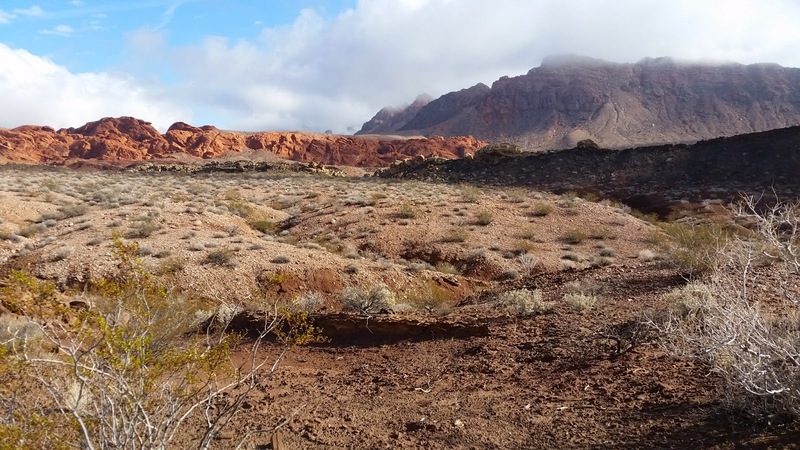 This pic was taken at the intersection of AR70A & 70B; 2 roads that run along the 'spine' of 2 ridges just east of Hoover Dam. From this point you can proceed further along the mountain spine to an abandoned mining area. Or just turn around and enjoy the view of Kingman Wash, the new bridge across the Colorado at the dam, or Boulder City. We also hooked up with Chris & Leslie, RVNomads2Too to take a short off-road drive & hike down to the Colorado River downstream of the dam. 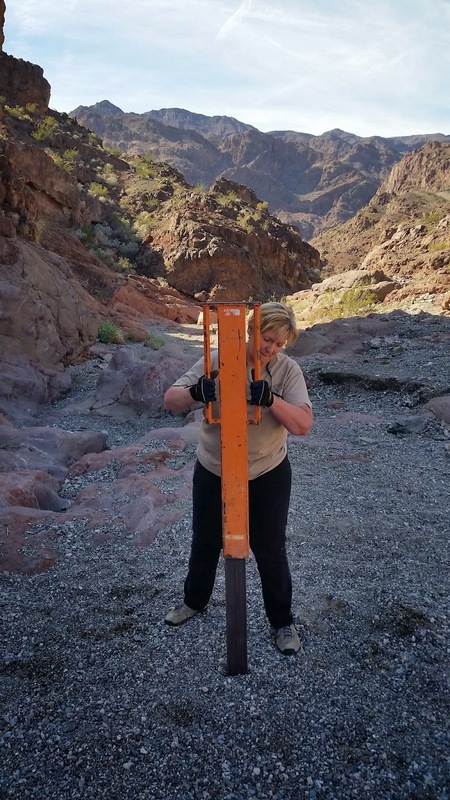 We may get to spend more time with Chris and Leslie as they are considering volunteering here at Lake Mead. After a good follow up appointment with my cardiologist, I was given the 'green light' to return to normal activities without restrictions. Joan and I left the doctor's office and drove to Palm Springs, California. 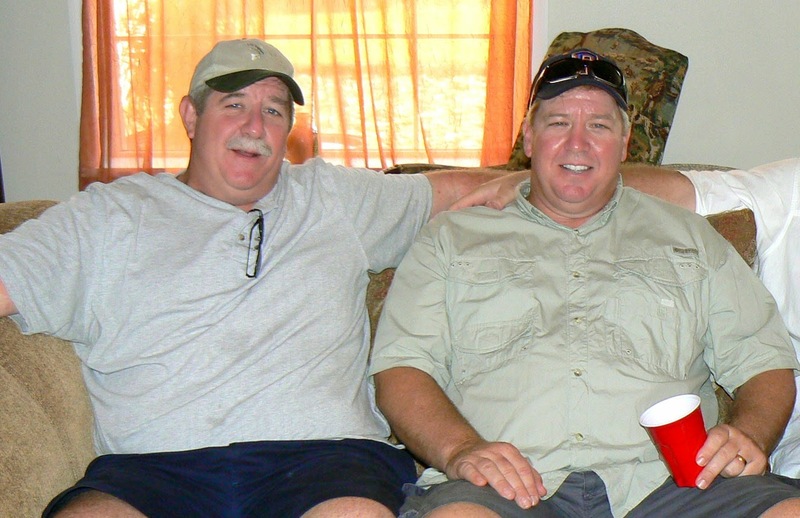 I was playing in a softball tournament there that weekend and we wanted to visit our friends Dave & Maxine of Wandering Wingers fame. On Friday we drove over the mountains from Palm Springs to Aguanga, CA and spent the day at their Jojoba Hills SKP park. Very nice! One of the topics we discussed was our summer job for 2015, working for an engineering firm 'inventorying' BLM back country roads in Utah, Idaho, Wyoming and Montana. We told them about our friends Jim & Barb, Jim and Barb's RV Adventure who would be working with us this summer. After a great late lunch in Temecula we headed back to Palm Springs. 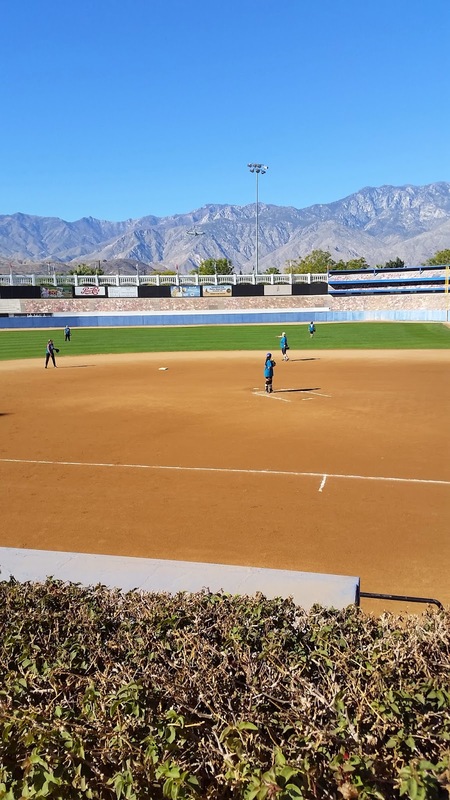 Saturday morning arrived full of promise and fun as we headed over to The Big League Dreams Sports Park in Cathedral City. Big League Dreams parks are complexes that create replica fields of places like Yankee Stadium, Fenway Park, etc. On Saturday we played all our games at Fenway. We lost all 3 seeding games and ended up seeded last in our bracket. As we were in between games we spotted a very large unique aircraft landing in Palm Springs, Air Force One. Sunday we played our 1st game at 7:30am in Yankee Stadium. We won! And we won the next 2. That put us in the winners bracket. Now we had to wait for the top contender to win their way out of the loser's bracket. We played our 4th game of the day (7th of the weekend) at 5PM against one of the teams we lost to on Saturday. 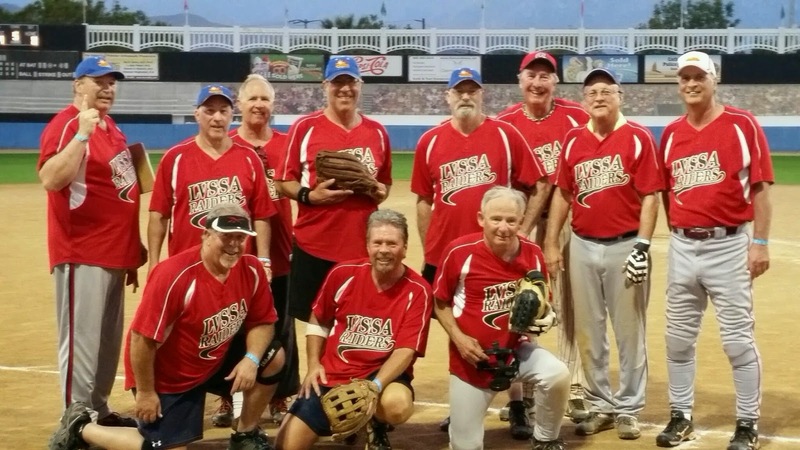 We ended up winning the game 19-0 to win the tournament. Never give up! One afternoon we decided to stop by Southwest Diner, one of our favorite eateries in Boulder City and a Diners, Drive In and Dive location. 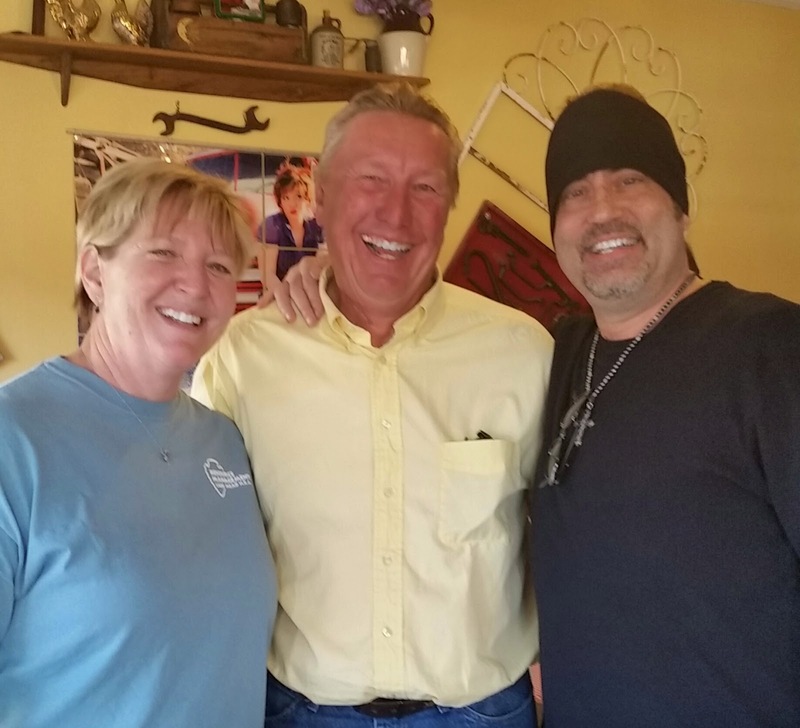 And who should we see out on the patio....none other than Danny Koker of Count's Kustoms & Counting Cars. Joan used all her womanly wiles to woo him into a picture. 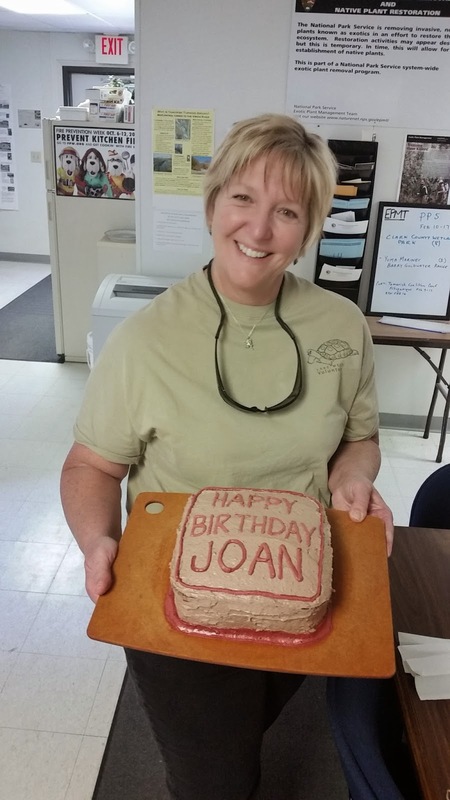 And 1 final picture of Joan and her birthday cake prepared by our boss Joseph! Thank You Joseph,,,,it was great! A Not So Funny Thing Happened to Me on the Way to Work! Joan and I have had an interesting couple of weeks since our last post. It all started on our trip back to Lake Mead from Yuma. 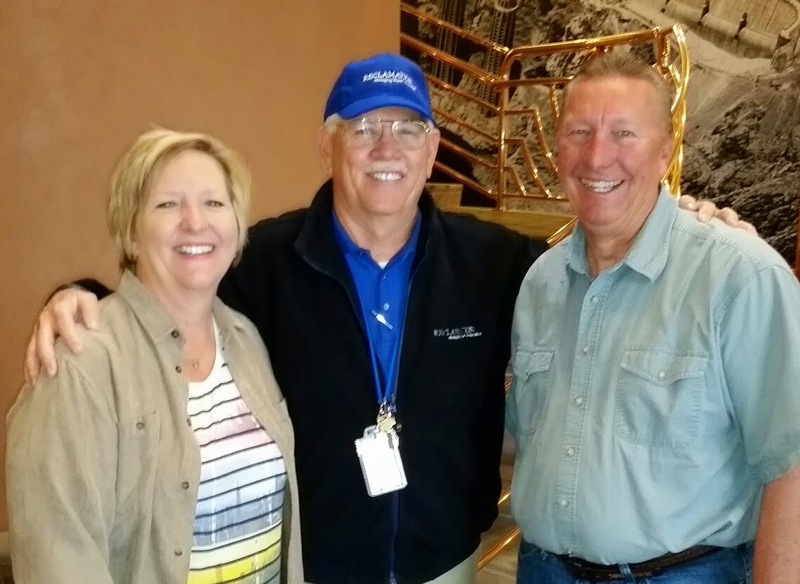 After stopping to have lunch with friends we contacted Chuck and Claudia, team leaders for an engineering firm that contracts to BLM (Bureau of Land Management). We wanted to find out more about the summer job their company had contacted us about. We seemed to hit it off right from the start as we discussed the similarities between our RV's and lifestyles. The job being offered would have us working in Idaho, Montana, Wyoming and possibly Utah & eastern Oregon this summer. 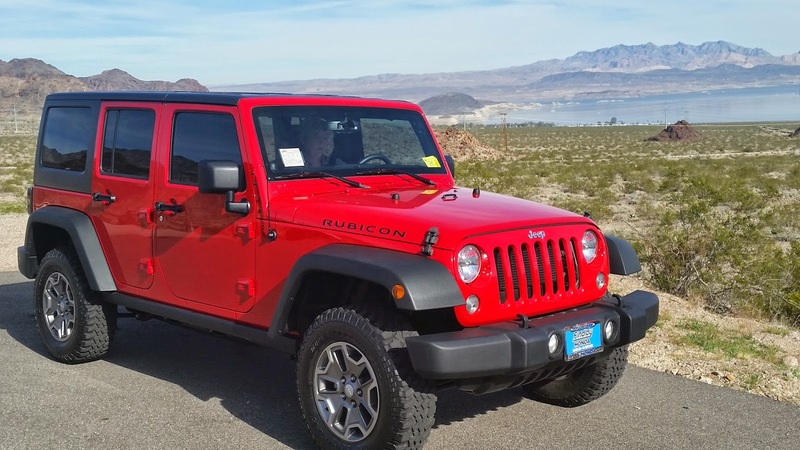 We would work 40 hours/week, drive our personal 4-wheel drive vehicle, utilize a provided tablet and GPS device to map BLM roads throughout the designated areas. Joan and I would be one team in a group of multiple teams that traveled and worked together for the season. The entire group would move to an area and set up in the same campground. Then each individual team would be assigned their own BLM roads to cover. Once an area was completed, the entire group would relocate to the next area to be mapped. 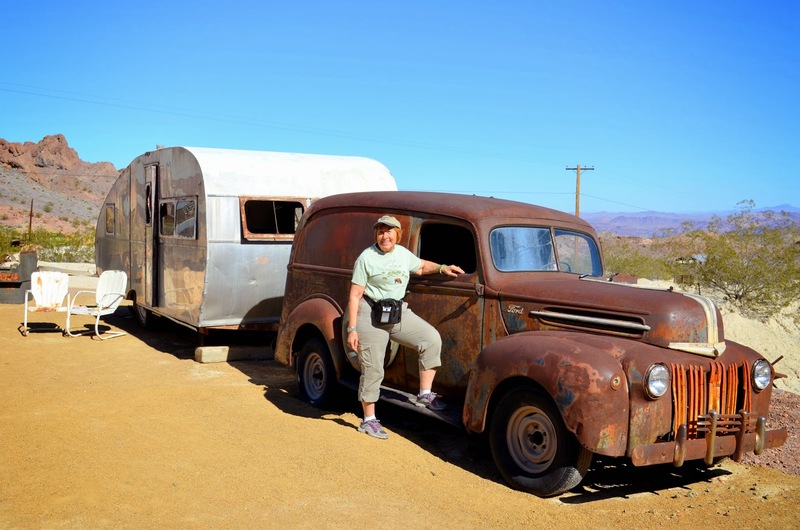 The company picks up our campground fees, fuel costs for relocations, fuel costs for personal vehicle use, per diem for each day your personal vehicle is used and a generous hourly pay rate for both Joan & I. We would be in an area for a few weeks before moving on to another. We were stunned. It sounded like a dream job for us. Let me think about this for a minute......we would drive our jeep off-road every day; through back country roads and lands that very few individuals get to see; stay in each area just long enough to do some exploring before moving; visit 3,4 or 5 beautiful states over the course of 5-6 months; and be generously compensated (see paid) for our efforts. What was it Ol' Brer rabbit said....."Please don't throw me in that brier patch". So we accepted the job and should start sometime in April. Wish us luck. 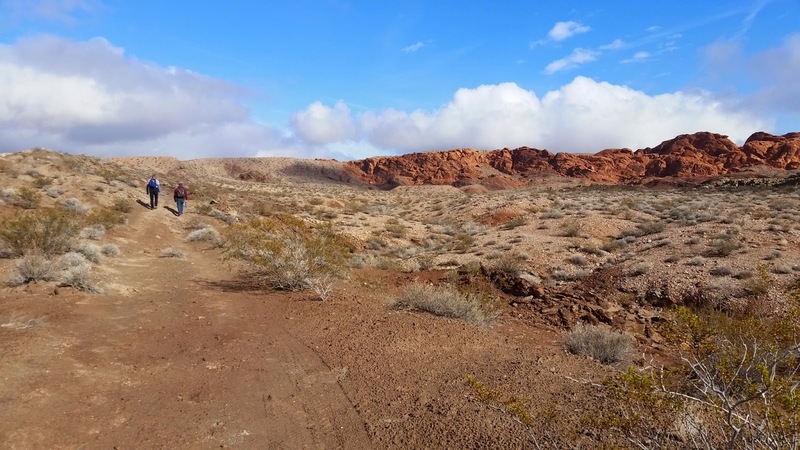 Last Wednesday we started our volunteer workday by driving about 40 miles south of Boulder City to Cottonwood North on the western shore of Lake Mojave. Just before we left the pavement to drive our back country roads for the day we spotted some vehicle tracks off the side of the road that needed documenting and restoration. Joan began her GPS of the track while I starting raking. As soon as I started to exert myself I felt a tightness in my chest and headache. When I stopped raking, the discomfort went away. When I started raking again, the pain came back. As much as I didn't want to admit it, I had a problem. I'd felt this discomfort once or twice before, but thought it might be related to congestion from a recent cold. I didn't want to drive another 10-20 miles out into the desert only to have something more severe happen. We packed up and drove back to Boulder City. I went to the emergency room and was admitted. 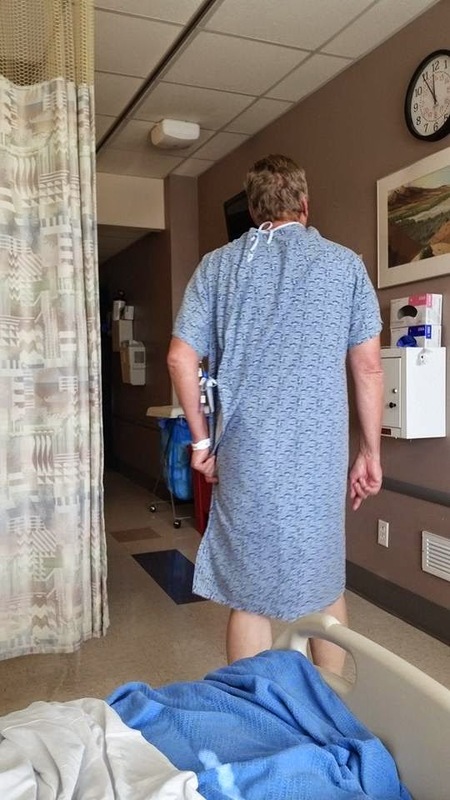 Between blood enzyme tests and a nuclear stress test on Thursday, the doctors determined that while I did not have a heart attack Wednesday morning, that I had had one sometime in the past and now appeared to have some sort of blockage. An angiogram would be needed. I was transferred that night to Desert Springs Hospital and Friday morning went for the angiogram. They found a 95% blockage in the right coronary artery and placed a stent. I was released Saturday with a restriction from lifting anything over 10 pounds for the next few days. The doctors explained that once the stent was placed no other issues were identified and that my heart was 'fixed'. Their primary concern after the procedure is the incision sight into the femoral artery next to your groin. Should that sight leak, bleed or clog, it can have serious consequences. But all is well at this point. I started back to work Monday and plan on playing in a tournament next weekend right after my follow up with the cardiologist. No Problemo! Yahoo! 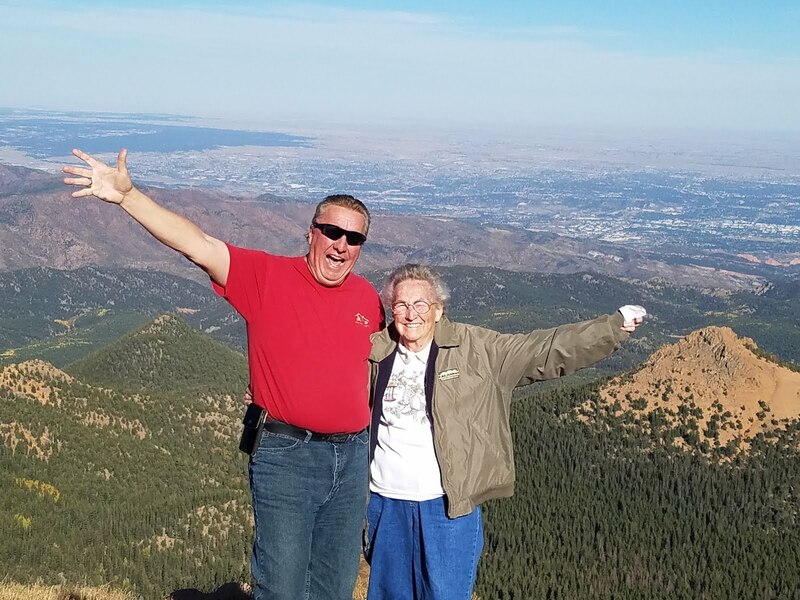 On our drive back from Florida this year, Joan and I discussed whether we wanted to continue and drive cross country each year or just fly home for visits. We decided that flying might make more sense. 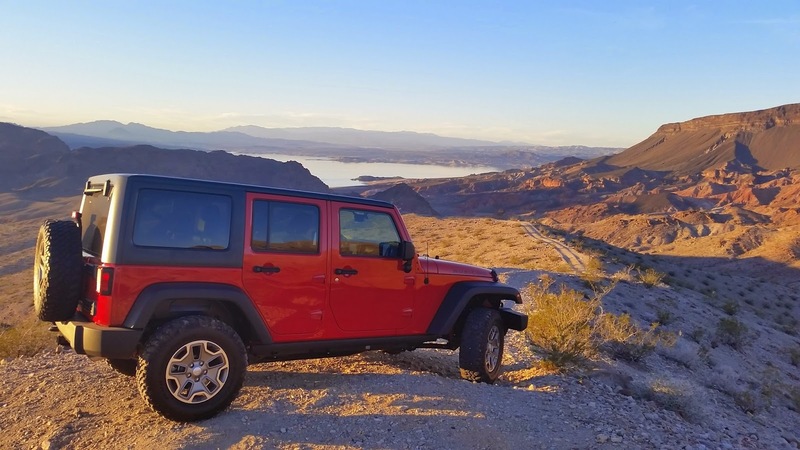 That being said, our decision 2 years ago to drive a Jeep Grand Cherokee for comfort rather than a Jeep Wrangler for adventure was no longer a primary factor. And with this new job requiring a lot more off-roading in back country areas, a Wrangler might make more sense. So we started shopping. We have really loved our Grand Cherokee and feel as though we've certainly gotten our money's worth. In the last 2 years we've driven 67K miles; got a crease in the passenger door where the wind whipped it open and it hit the front fender leaving a dent; several dents in the hood from hail in South Dakota; 2 small chips in the windshield; and an AC fan starting to make noise. Wednesday we decided to trade for a used Jeep Rubicon. The stars must have been aligned because on the way to the dealership to make the trade, a semi truck on the interstate threw up a small rock and bingo....windshield chip #3. Then 10 miles from the dealer, the low fuel warning light came on the dash. I think we managed to milk all the 'goody' out of that one. We're excited about the new vehicle and all the new places and adventures we'll be experiencing with it. 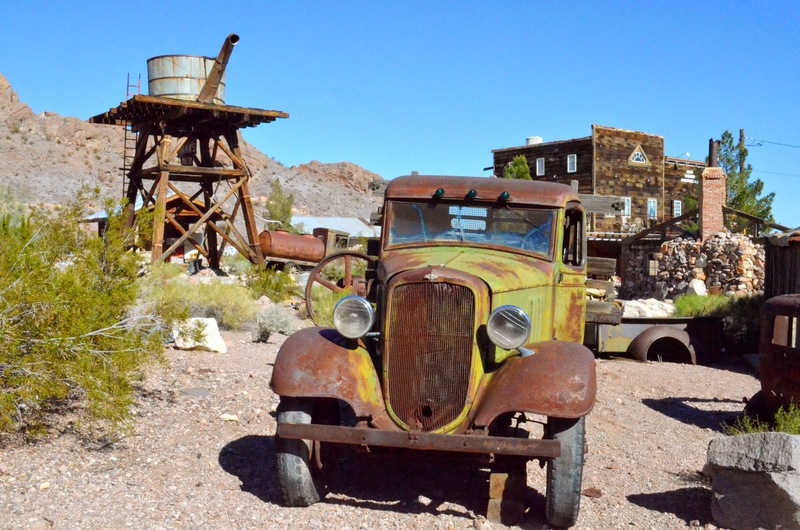 You know you just never know what you might find as you explore the area in and around Lake Mead. We stopped Tuesday to repair a sign that lost a bolt and was hanging crookedly from its post. As Joan looked around the base of the post for the missing nut & bolt she noticed something quite unusual. A roach and a die. No not your scurry around the floor in the dark roach. And not a 'you've had a heart attack' die. 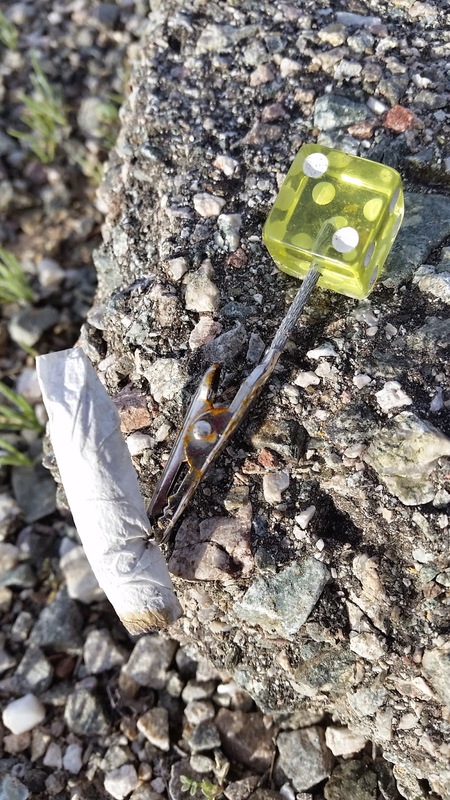 But a die roach clip with a roach still in it! Probably explains what happened to the sign. 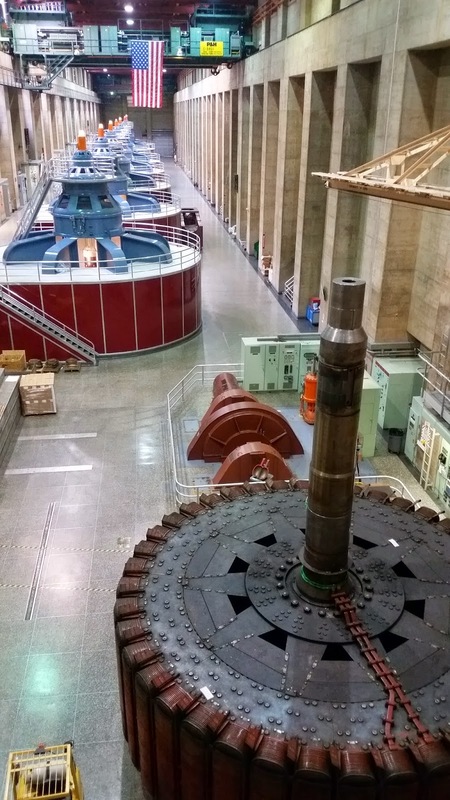 We joined a group of volunteers last week and took a tour of Hoover Dam. It's really amazing to think about the engineering and abilities of the folks who designed and built this in the early 1930's. Here's a pic of the turbine room. If you look at the top of the pic you'll see an American flag hanging from a 300 ton lift. At the bottom right, the insides of the actual turbine, the rotor which weighs in at 400 tons. They have to use 2 of the 300 ton lifts to remove and replace the rotor. WOW! During the tour one of the Dam Tour Guides approached us and started to chat. "Where ya' from?" "What part of Florida?" "Of course I've heard of Ocoee and Winter Garden. I graduated high school there. My brother is the barber in Ocoee!" Charlie was our tour guides name and his brother Larry still cuts Joan's dad's hair. What a small world! Now many of you may not know it, but I don't like to show pictures of food on the blog. Just my little pet peeve. So this pic is in the category of agriculture and plants. 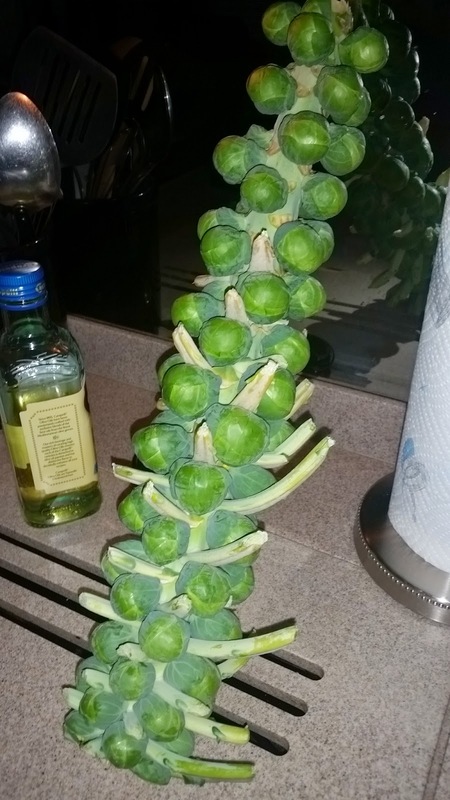 Joan stopped in the Dollar Store the other day and they had brussel sprouts still on the stalk. Never saw that before so I thought I'd share with you what it looks like. She cooked it up and said it was really yummy! Shout outs to many of the Ritten clan. February seems to the birthday month for several of them: Happy birthday to brothers Paul, David and Michael; nephews Colby & Cody; and belated January birthday to Joan's son Sean. Happy Happy! And a big happy birthday to Joan next week 2/11.